*Note: I like joining my shapes using the back loops only. You can do whatever you’re comfortable with! 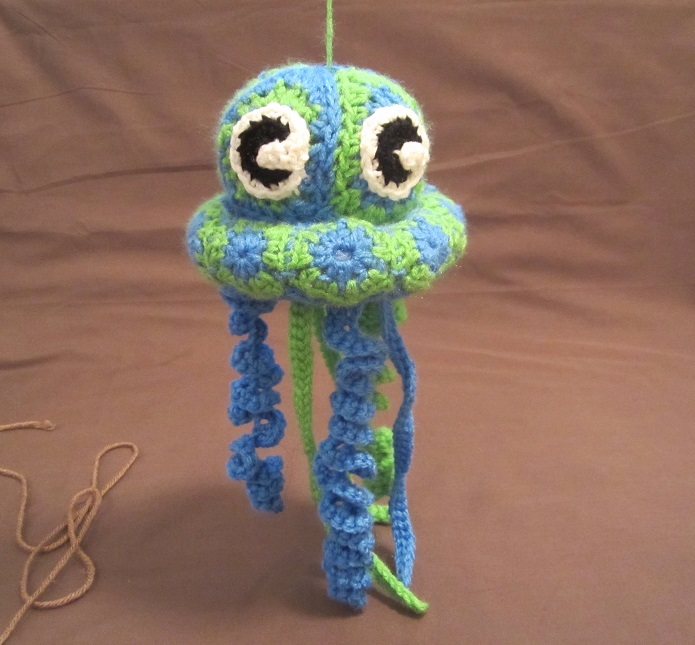 The body for the jellyfish is made the same way as my Petapus (Octopus) body, and then you construct the jellyfish bumper and sew it onto the body. I’ll explain again how to do the body. 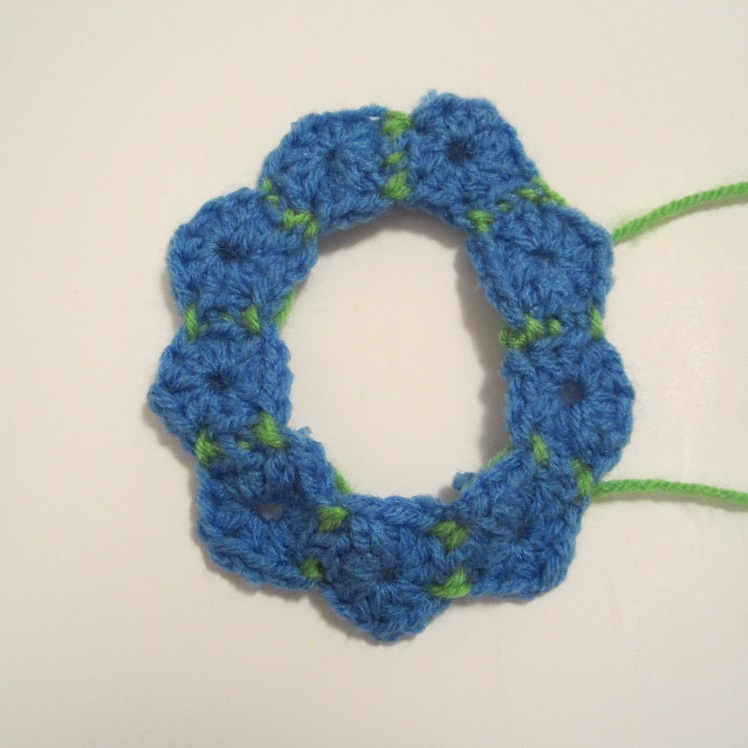 For the bumper you will make two rows of side-by-side pentagons, connect each one to create two separate rings of pentagons, and then join them together on each side to create a mini doughnut. (Incidentally, if you need a Doughnut-gon, or a Pentanut…Doughnut, here ya go!) Then you’ll slide that onto the body and stitch it in place. For the top round of the bumper, use an F hook and make 9 petagons using only Rnd 1 and 2 of above pentagon. Sew these side by side with the flat ends of the pentagons in line. The other side will make a jagged appearance, which you will fit the bottom round into like a little monster’s sharp teeth. What? Is that a weird analogy? For the bottom round of the bumper, use a K hook and make 9 pentagons using only Rnd 1. Sew them together side by side in the same way as the top bump, and then attach the jagged end of this neatly into the jagged part of the top of the bumper. Sew the two flat edges together, stuffing as you go along, then fasted off leaving the tail long enough to sew the bumper to the body. Slide the bumper onto the body with the 2-round pentagons on top and the flat joined edges should be facing the body so that seem will be hidden in the finished project. I make three of each: curls and straight, but you can experiement to see what you think is best! Curl: Ch 40, 3sc in 2nd ch from hook and each ch up the hook. 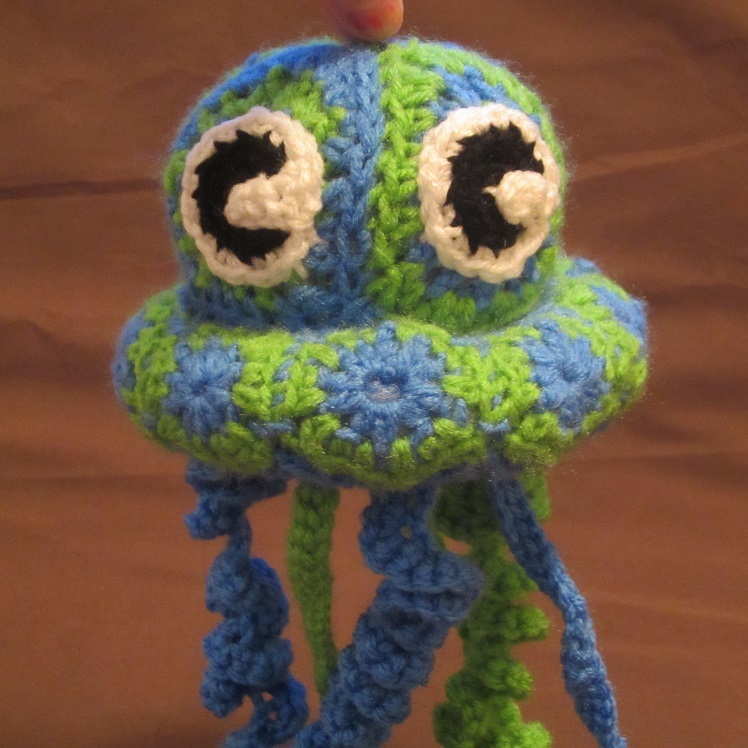 Fasten off leaving tail long enough to sew tendril to body. Straight: Ch 40, sl st in 2nd ch from hook and in each ch. Fasten off leaving tail long enough to sew to body. 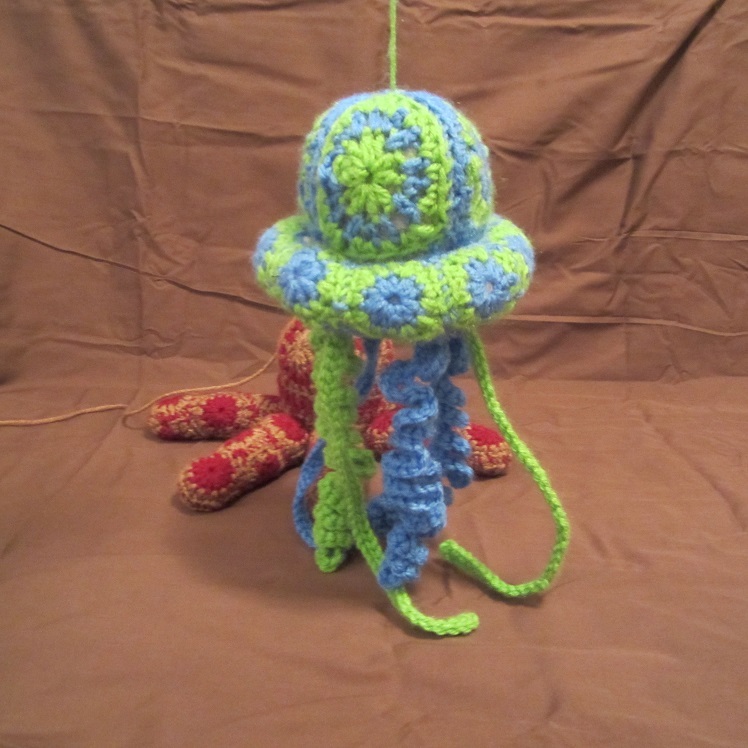 This entry was posted in Uncategorized and tagged Craftyghoul, crochet, fishy, free, Free Pattern, how to, jelly fish, jellyfish, kid, ocean, octopus, pattern, sea, squid, Starling, tendrils, water. Bookmark the permalink.